The school's colours are navy blue and fire engine red. Windcheaters, track pants, shorts, t-shirts, polo-shirts and hats are available for purchase from the front office. Iron-on badges with the school emblem are also available from the front office. It is school policy that hats and sunscreen are used during the summer. We have a ‘no hat no play’ policy all year around. Sunscreen is provided in the summer months. Hats are available for purchase at the front office in three styles - wide brimmed, legionnaire and bucket hat. Hats must be navy blue and plain or with a school logo. School bags are also available from the front office. The school bag is a 2-way combined backpack. 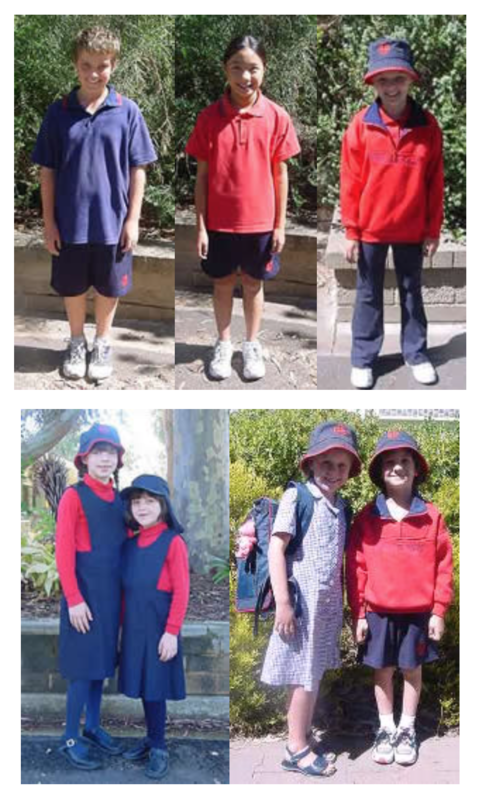 All students are required to wear the correct uniform/dress code at all times. Commercial logos, larger than a 50 cent coin are not acceptable. Makeup is not appropriate. Only studs or sleepers should be worn by students with pierced ears. To recognise the last year in Primary School, the Year 7 uniform is a navy blue polo shirt instead of red. A special Year 7 commemorative jumper is available for order during the first term with the names of all the Year 7's printed on the back.